EMILY: The newspapers assure us that Fantômas doesn't exist. He is an invention of some French journalists. DICKSON: Scotland Yard denies his existence because they're unable to catch him. This never-before-translated play was initially performed in Belgium in 1914 for a few weeks before World War I began and has never been restaged since. 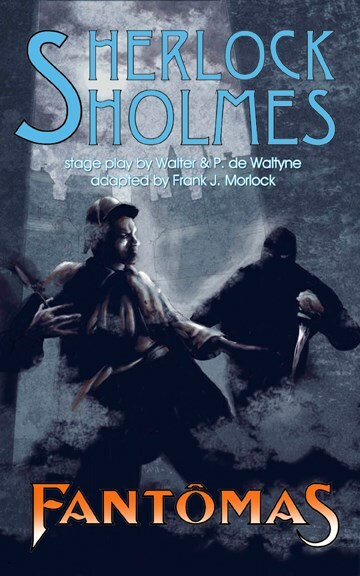 The play was translated and adapted by Frank J. Morlock, author of Sherlock Holmes: The Grand Horizontals in which Holmes also crosses swords with Fantômas. The book includes an introduction, afterword and chronology of Fantômas by Jean-Marc Lofficier. La Mort d' Herlock Sholmes, ou Bandits en Habits Noirs, by Pierre de Wattyne & Yorril Walter - a drama in 5 acts (1914).